We’ve had sunshine and showers this bank holiday weekend but no matter what the weather, weekend afternoons are perfect for watching old movies, and popcorn is the perfect accompaniment. I remember watching my Mum make popcorn when I was a little girl. She used to have a saucepan with a glass lid so we could see the corn hit it and explode. 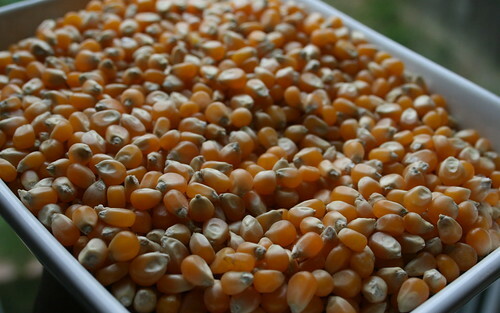 Standing on tiptoes by the cooker with my sister, waiting for the corn to start popping, was unbearably exciting, and with the first sudden pop we’d squeal with delight. Making it now takes me right back to that time and really brightens up a rainy afternoon. Pour the oil into a large saucepan that you have a lid for and heat it over a medium heat. Add the maze and swirl it around the pan to coat it in the oil, and then pop on the lid tightly and wait – this is the fun part. After a few minutes you’ll hear the maze start to sizzle and not long after that it will start to pop. Every now and then shake the pan to help all the maze to pop. When the popping has subsided wait another few minutes before taking off the lid – you sometimes get surprised by a sudden pop! 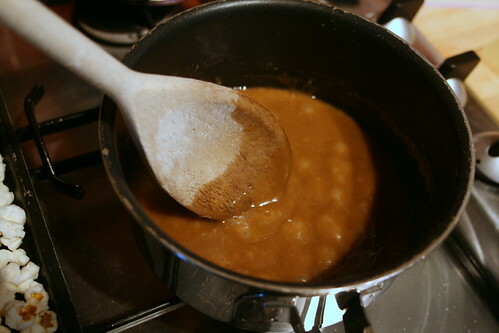 To make the toffee sauce heat the butter and sugar over a low to medium heat and stir it with a wooden spoon until the butter melts and the sugar dissolves. Bring it to the boil and boil it for a few minutes until it thickens. 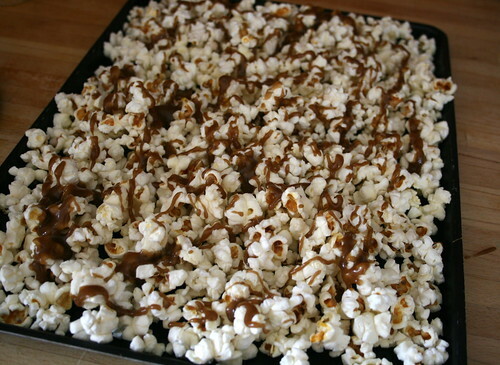 To coat the popcorn in the sauce I find it easier to tumble the popcorn onto a non-stick baking tray and then drizzle over the sauce. Do this while the sauce is still hot. Tip the popcorn into a large bowl and serve straight away. Ooh, that sounds delicious. I think that's one of those recipes I won't be able to get out of my head until I actually make it myself. Mmm. I've just seen the cover for your book on the sidebar. It looks wonderful. Congratulations! I'll surely return to this recipe of yours next year. 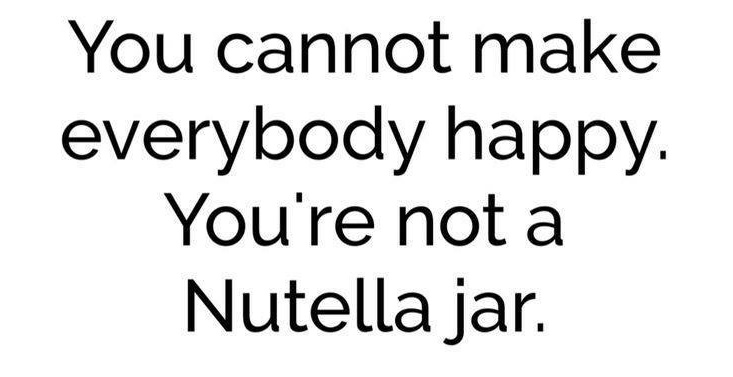 Right now is getting too warm here for popcorn and we're still full of sweet from Almonds and Chocolate Easter Eggs. Homemade popcorn always reminds me of my Italian housemate I had in the 90s, she used to make it at least once a week. Sadly my own efforts all too often result in burnt saucepans!!! What a fun and easy treat to make! Thanks for the idea! 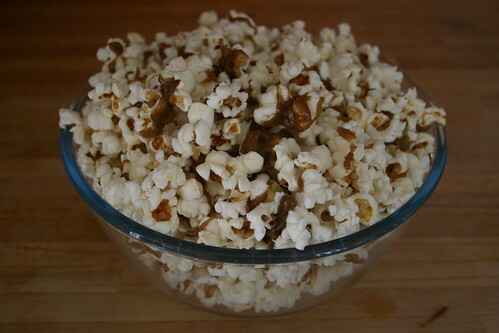 I have become a recent addict to homemade popcorn, but tend to go for savoury – however I think I shall be trying this one. As it is so so easy why do people pay so much for microwavable, packet and cinema popcorn, all of which do not taste so good and are full of all sorts of nasty additives. Just checked your blog to see if I was still in with a chance to enter your Easter competition – alas I'm too late. But having just spotted this popcorn recipe, I'm now really excited. I haven't made popcorn for years, but we are going to be watching a DVD tonight and a friend gave me (and I hope it wasn't too long ago) a pack of coloured popcorn. So guess what I'm just going to pop down to the kitchen to do. Also saw your book – well done, you must be really pleased that most of the hard work is over now. Choclette – I haven't posted the Easter Cake Bake round-up yet so if you're quick and email it to me I'll include it. Thanks for your comment about my book; it is nice now most of the hard work is over. Hope those of you who make it enjoy the popcorn! Thank you for this. I've tried sending you an e-mail, but it failed to get through – I'll try again!